3BR, 2BA, Sleeps 5, 1100 Sq Ft.
Vintage bungalow completely renovated from top to bottom, everything in this home is brand new! Our house is full of character and charm on the West Side of town, offering 3 bedrooms and 2 baths for a comfortable stay. Great location, 3 blocks from the historic Paso Robles downtown area. Paso’s downtown offers shopping, tasting rooms, restaurants, bars, theaters, and the city park (concerts in the park every Thursday throughout the summer). If you are visiting the area for our famous Paso Robles Wine Country this is the perfect location to start your vacation. Cozy and comfortable for you and your guest or family ! Our master bedroom includes a Queen size bed with a private bathroom, a flat-screen TV and also has access to the deck and backyard. Second bedroom offers a Queen size bed and our Third room offers a comfy cozy day bed for one.. Another full-bathroom is off the Living Room. Our fully renovated Kitchen will be stocked with all you basic needs, our Dining Room seats 4-6 comfortably. House is surrounded by a white picket fence, as you approach the orange front door you may choose to stop and relax on the cozy large front porch and enjoy your Wine on Pine, or choose to BBQ and relax around the fire pit in the back yard. While visiting the beautiful Central Coast area , you may also want to visit our beaches and downtown areas in Avila Beach, Morro Bay, Cambria and Hearst Castle. Just about a 30-40 min drive either way. Which also includes, shopping, restaurants, bars , tasting rooms and much, much more! Feel free to contact us for suggestions, to help make your stay in Paso Robles one to remember. We will be happy to help! Mary & Terri - Best friends since 7th grade, grew up in the Great state of Michigan! With our Mid-Western values we fell in love with the small town atmosphere and friendly people in Paso Robles. We always thought we may go into business together, so, we decided to combine our love of wine and Paso and buy a vacation rental home that we could share with guests. Awesome location walk to downtown and to the Mid-State-Fair. Terri and her husband have been traveling to Paso Robles for many years "Wine Tasteing” and always had a great time and now own a home on the West Side of town. Mary has been visiting and fell in love with the location, great cycling, beaches, and WINE! So we decided to buy this beautiful home downtown and offer it as a vacation rental. We love the downtown area as well as the surrounding areas. Great restaurants and tasting rooms surrounding the park. Not to mention the friendliness of all the local people and the tourist too! We also enjoy going to music in the park during the summer months on Thursday nights taking our wine and picnic and fitting in with the locals. While visiting Paso Robles there are so many things to do and places to go or you can just take in the friendly atmosphere of the local downtown. Easy walk to Downtown, you can park in the driveway and in front of the house on the street . Walk North to our very popular Mid -State-Fair! Easy access on & off Hwy. 101 South & North, & Hwy.. 46 East & West! . 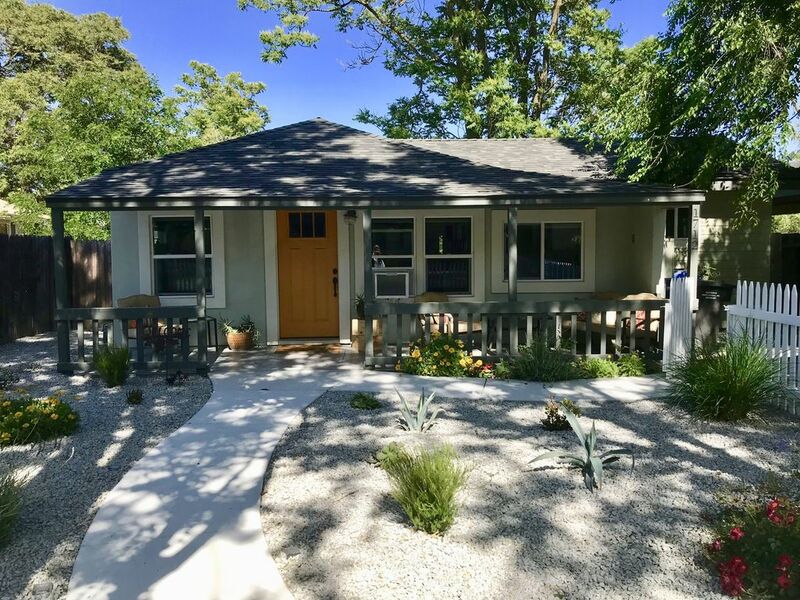 A beautiful old bungalow turned into updated modern with a orange front door you can't miss and plenty of room to relax and enjoy your glass of wine on the front porch with your family and friends. You will find every room in the house brand new including furnishings. " Cozy and comfortable is what our guest are saying". Or enjoy your wine on pine at the back yard fire pit or while your barbecuing . There is also a patio table to enjoy your meal for 6 , under a large umbrella for shade.The house is on the West side of town that is walking distance S. on Pine st. to the central park and tasting rooms, shops, bars, movie theater, candy stores, local boutiques and many great restaurants! Our central location is within an easy 5-20 minute drive to the East and West side wineries within the Paso Robles Appellation. If you love to get away from the hustle and bustle and be in a small town atmosphere this is the place for you to enjoy and relax on Wine on Pine 🍷 Cheers!! All new appliances, cabinets, flooring. Will have all the convinces of home! Fully stocked! We would love to help you plan your stay while you're in Paso! Let us know if there is anything we can assist you with to make your vacation that much better!! The house was immaculate, freshly renovated and nicely decorated. We've stayed in a number of vacation rentals, including several in the area, and this was one of the best. Everything we needed was available and we were very comfortable during our three-night stay. Would definitely recommend this property to anyone and will keep this on our list for a future visit. We had a really nice couple days in Paso Robles and it was enhanced by this property. Everything so nice and new and functional inside and out. We'll definitely stay here again when we return to the area! We are so glad you loved our house and location . We Thank-U for taking the time to write a review. Hope you can stay with us again soon! Charming little house that was perfect for our stay in Paso. Walking distance to all the restaurants downtown. Very clean and had everything we needed. Location , location, location! That is exactly why we bought this house! We are so glad you were able to walk downtown and enjoy all the restaurants . We strive to keep our home clean & comfortable and have everything on hand you may need during your stay . Please visit us again ! Super clean, cozy & quaint and convenient. A great stay for girls wine country wknd. Highly recommend. Thank you very much for the nice review. We are so glad you girls enjoyed our clean , cozy home and we hope you will stay with us again soon. We are 4 short blocks walking distance to the main downtown park , restaurants , tasting rooms , movies and much more. If you walk north we are also walking distance to our Famous Mid-State-Fair. Easy access to Hwy 101 and Hwy. 46 . Most outlying wineries are within a 5 to 30 minute drive. Park right in driveway and or in front of house on street. Great Location! 100% refund if canceled at least 30 days before arrival date. Must pay in full when booking is less than 30 days in-advance. Please inquire for monthly rates.